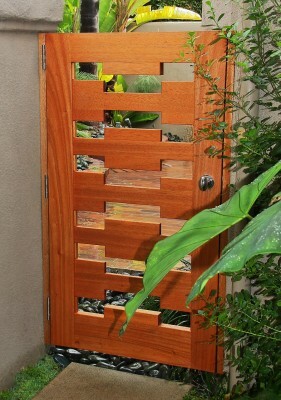 Our High Quality line of gates are made of Philippine Mahogany with a thickness 1-3/4”. Mahogany is a dense wood that handles abuse very well. It also offers a “Grand” and more heavy feel. This is a wood that is born and raised in a Tropical humid climate and is able to withstand moisture over the test of time. To further insure against moisture issues, we assemble these gates with a 2-part Epoxy Glue system. Boat builders and the Marine Industry in whole settle for nothing less than the 2-part epoxy system when joining any wood parts that will be exposed to high moisture areas. Although more expensive, tricky, and time consuming to work with, the bond created with this type of glue is one that you will not have to worry about in the future compared to the commonly used water based wood glues.